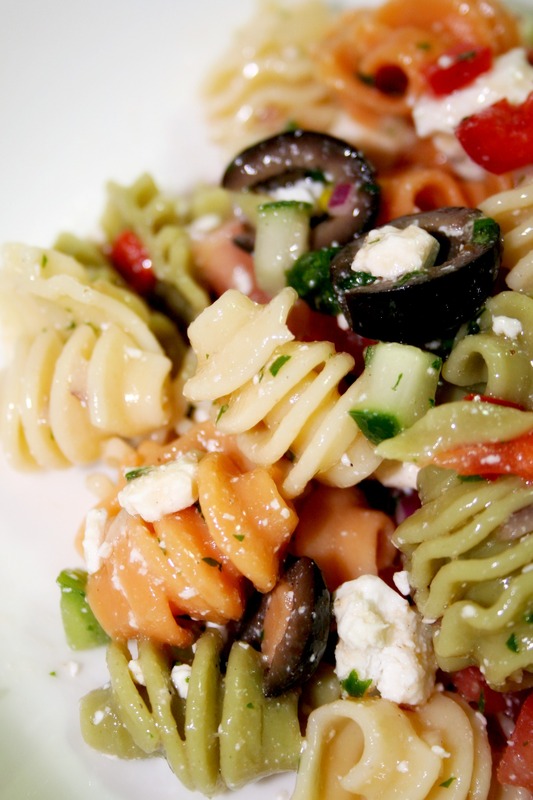 I like this pasta salad because it’s made from simple ingredients that most people love, and the flavors are bright and tasty. Nothing strange here – just crisp veggies and curly pasta sopping up lemony vinaigrette. The whole mess gets an added treat from crumbles of feta and salty olives. It’s so friggin’ simple, you’ll want to have some on hand in the fridge for an easy side dish on days when it’s too hot to turn on the oven. I use tri-color pasta here, but when I’m feeling a little decadent, I replace the pasta with cheese tortellini. It’s a little more nourishing, so don’t waste it at a party full of people you don’t really like. They can get their own tortellini. For my vegan darlings out there, leave out the feta and use regular pasta so you too can feast like a champ. Boil pasta until al dente. Drain and cool with running water. Shake off all water and then turn out into a large bowl. Add bell peppers, cucumber, tomato and olives. Stir to combine. In a small tupperware with a well-sealed lid (or a jar), combine thyme, parsley, garlic, lemon, olive oil, red wine vinegar, pepper and salt. Shake well. Pour over pasta and stir. Add feta and stir again. Refrigerate for at least 20 minutes before serving. This pasta will be slightly oversalted before refridgerating. When you cool the pasta in the dressing, it absorbs the salt, so once it has cooled, it will be perfectly salted. and it's so much better cold and left over anyway. 😀 mmm I love this kind of pasta salad. This has always been one of my favorite summertime picnic dishes! Yum!